My daughter is very into Barbie dolls right now, and she particularly likes to dress them up and accessorize them with shoes and head pieces. Princesses and queens are always at the height of her fashion choices, which is nice because they are often over-dressed, with many layers of beautiful lace and puffy crinoline – a stark contrast to the mini-skirts many of the dolls are sold in. Even though I am grown, I am also still quite attracted to the exquisite garments of queens, and the length that was gone to in making them. My husband and I have been watching the PBS series on queen Victoria, and her royal position is certainly adorned with many beautiful dresses, crown, and jewels. As Mother’s Day came this year, we brought home a beautiful concrete garden statue of Our Lady of Lourdes, to grace our front garden. Her cascading veil shrouds her from head to toe, in a flowing feminine mantle fitting a queen. There, among the roses she looks out in prayer. There is something about that image of her veil however, which is forever linked with the mystery of Our Lady. Her sacred humility perfectly in union with her immaculate queenship! To veil something, is to separate it from that which is common. This is often done with things or people who are set apart from the common and ordinary of our everyday. The Temple in Jerusalem veiled its most sacred space until Christ unveiled the salvific mysteries to Gentiles as well as Jews by the work of his death. As well, the Church’s 7 sacraments, or “mysteries” are veiled in the forms of water, oil, bread and wine, the priest, spoken vows, and the laying on of hands. In the mass, the priest covers the chalice with a chalice veil until the Offertory and again after Communion. The priest’s body is also fully veiled throughout the mass with several significant layers of cloth. The chasuble is a large circular cloth that envelopes his entire body. The tabernacle is also veiled. Paul dedicates an entire section of his letter to the Corinthians to the subject of head coverings (1 Cor 11:2-16). Paul particularly mentions women covering their heads when they pray or prophesy. This was a customary form of reverence before God, as woman is the glory of man, and she herself is a vessel capable of bearing an eternal life. The Blessed Mother is truly our model of this veiled purity and reverence before God. We are reminded of her great humility and docility to the Holy Spirit each time we look upon her veil. In fact, I recall how unsettling it was to see a statue of the Blessed Mother in a church without her veil. At first I was convinced that it must have been a statue of a saint and not Mary, even though every other symbolism suggested it was so. Reading the plaque on the statue made me quite upset, perhaps because it seemed as though they were making her impure, or at least taking away the sacred mystery that rightly belongs to her. Scripture has no shortage of verses on the significance of the head; both of the body, as well as indicating authority. Hands are placed upon the head in blessing, as well as on the sacrificial animal, of which sins are laid upon. The head is anointed and in times of grief it is covered. Another vestment worn by the priest at mass is the amice. This is an oblong piece of cloth that the priest places on his head long enough to say a prayer, before resting it on his shoulders. The prayer is: “Place, O Lord, on my head the helmet of salvation, so that I may resist the assaults of the devil.” The helmet of salvation is taken from the armor of God in Eph 6:17. Christ is the head of the church, which is both his body, and that which he saved through the laying down of his life. In this same way, a husband is to be head of his wife, with whom he has become one flesh, and out of such great love would lay down his own life for (Eph 5:23). 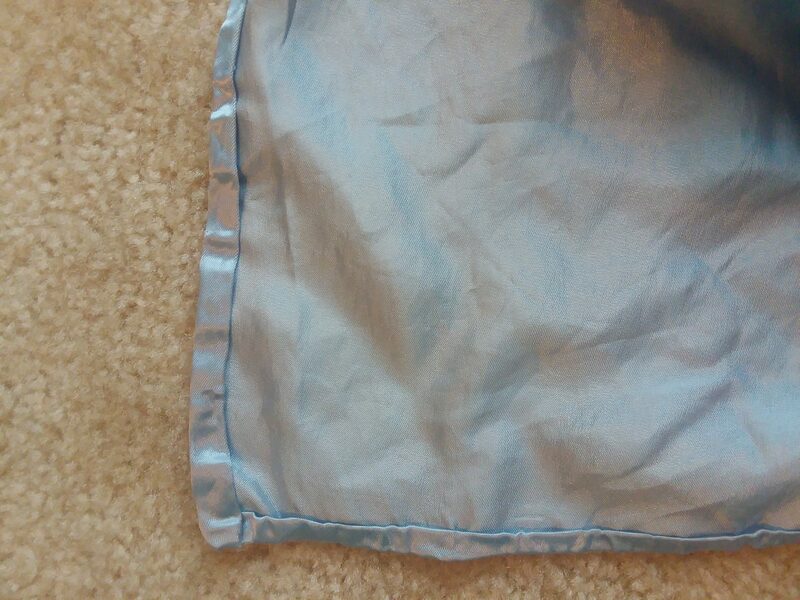 We cut a 8″ x 12″ piece of pretty light blue satin (which was leftover from my prom dress, if you would believe it). Fold the edges and hot glue them, so they don’t fray. 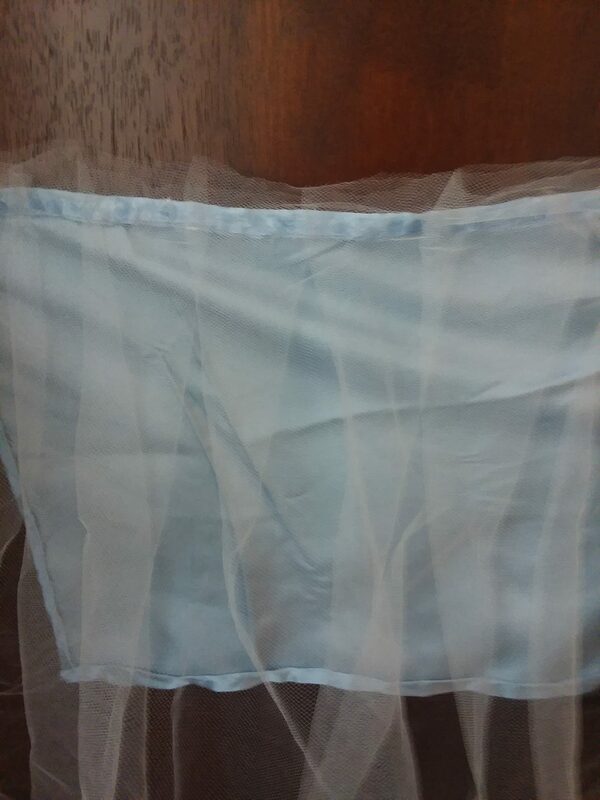 Cut a 12″ x 15″ piece of white tulle. 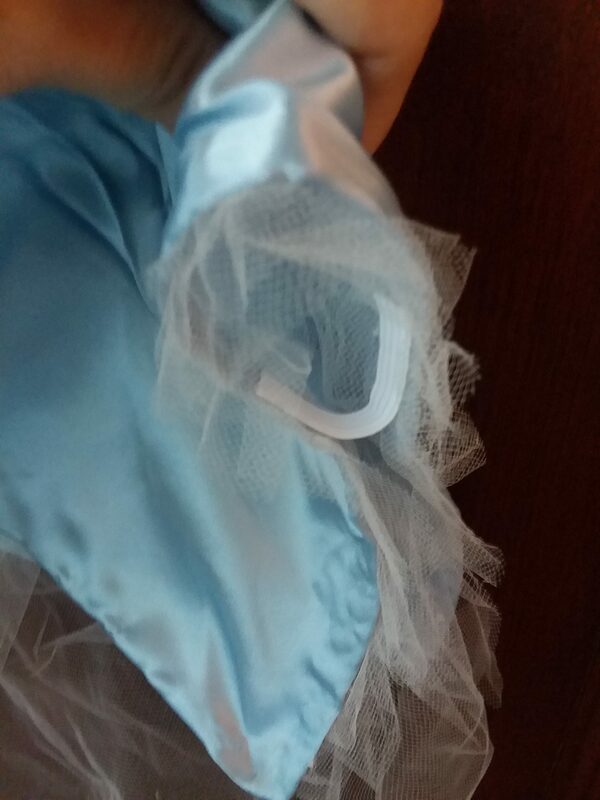 Fold the tulle in 1″ pleats along the top 8″ side of the satin rectangle and hot glue. 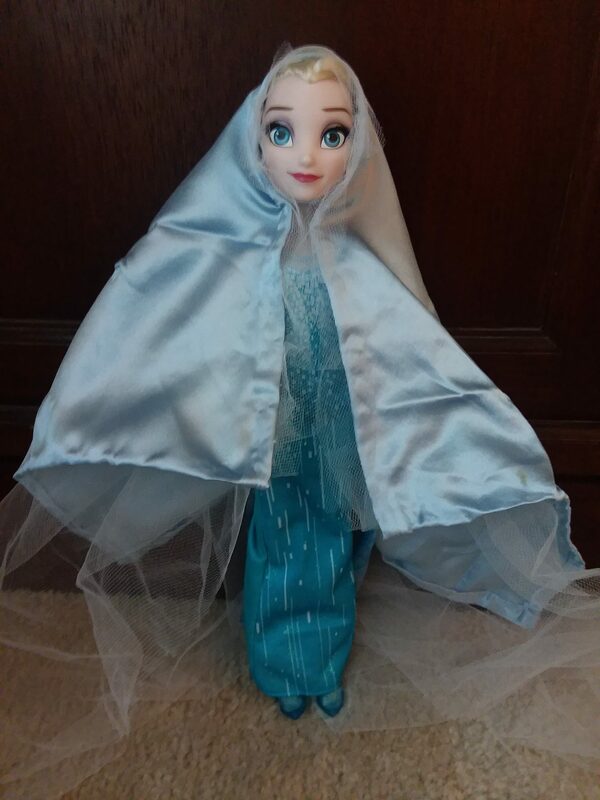 Fold the veil in half and place it on the doll’s head. Measure the dolls head inside of the veil, and mark the bottom of her chin. Hot glue a 2″ piece of elastic, which will secure the veil from falling off her head. 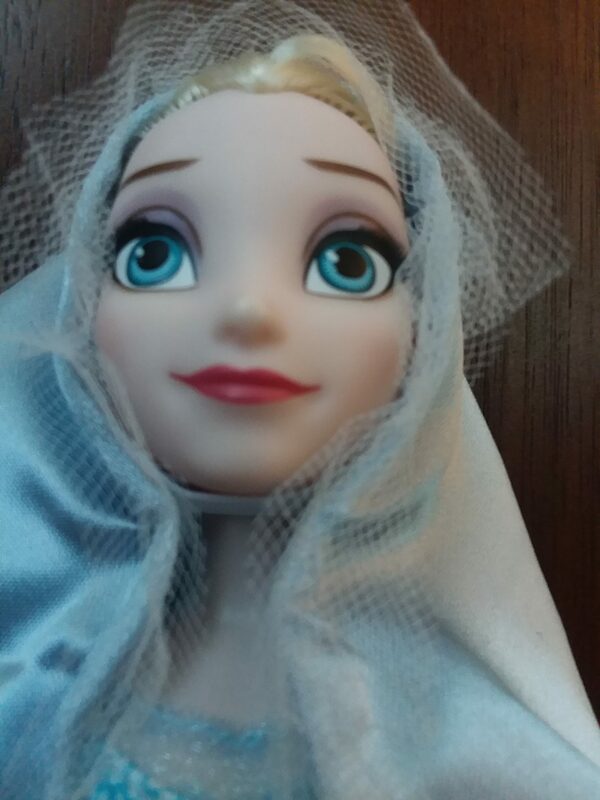 (This close-up shows the elastic under the doll’s chin, and the tulle framing her face). Here is the full veil…just need to add baby Jesus! What a beautiful post in many ways. It captures what many of us have lost – the true innocence of looking at simple things through the eyes of a child. 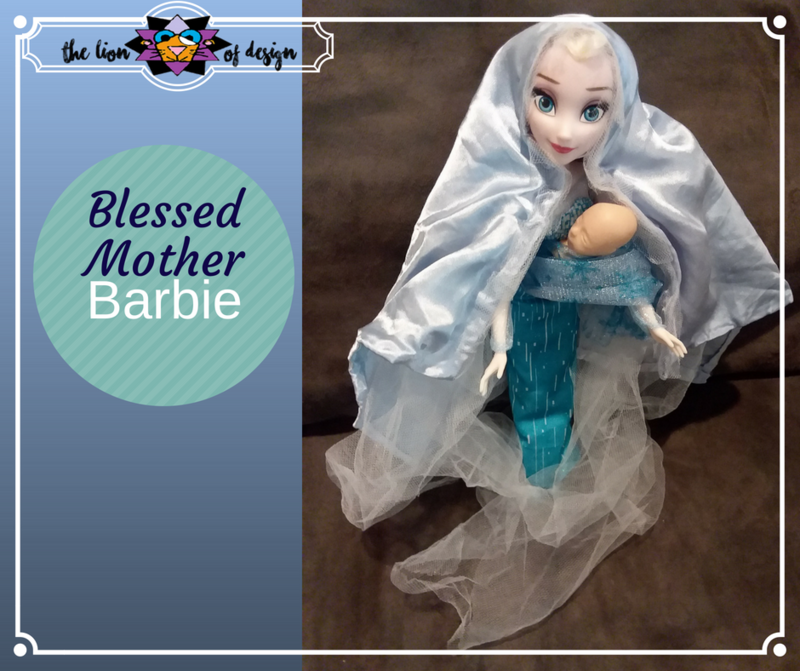 The “Blessed Mother” version created my The Lion & her daughter uses this little doll as the medium for a project to make a sacred and creative connection and a thing of simple beauty in the true spirit of Matthew 13.3. 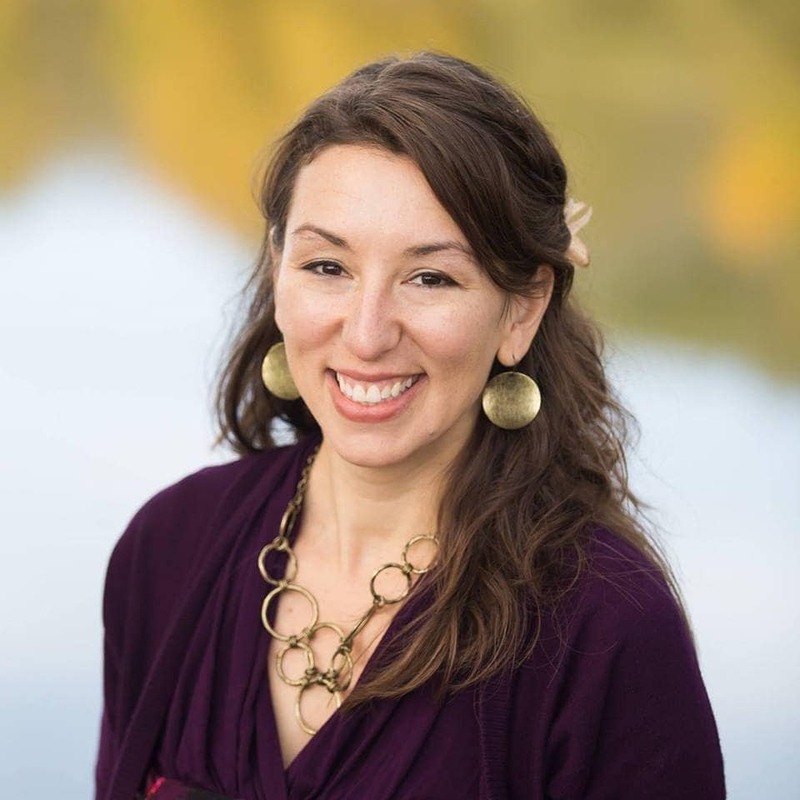 She goes the extra step to provide some history, and even low-cost materials that parents can use to create similar Christian mother/daughter projects. Thanks for the encouragement! Modesty is such a sacred gift to protect in my daughter, and I pray that I can exemplify and demonstrate the awesome supernatural legacy handed on to her as a woman, despite the hostile culture she may be in.